Rakesh Kumar Wadhawan, Executive Chairman, HDIL. Housing Development & Infrastructure Ltd (BSE: 532873, NSE: HDIL) on Wednesday witnessed massive offloading of 34.96 lakh shares by the FII, Robeco Capital Growth Fund, which is around 0.83% of the total shares in the company. The noted sell, executed at NSE, was at Rs. 110.08 a share, making the deal worth Rs. 38.48 crore. Robeco was not holding more than 1% stake in HDIL as of Q3 end, and as such, the sell is likely to be a total exit by Robeco from the realty major. Earlier, StockExplain had reported that HDIL had witnessed notable buys by two FIIs, Merrill Lynch and Goldman Sachs. While Merrill Lynch bought a 0.57% stake for Rs. 25.44 crore, Goldman Sachs had acquired 0.53% for Rs. 21.66 crore. Both the buys were at lower levels, with Merrill Lynch buying at Rs. 107.36 a share and Goldman Sachs buying at Rs. 97.80. Interestingly, both the buys as well as Wednesday’s sell by Robeco had no identifiable institutional investors or promoters as counterparties, which implies that the wider market was affected in the buys and sell. HDIL had rallied till Rs. 135.40 after Goldman Sachs’ buy, and then corrected sharply, and rose only till Rs. 117.40 after the more recent buy by Merrill Lynch. Robeco’s sell cue seems to be the recent disclosures by HDIL regarding certain transactions by promoters. 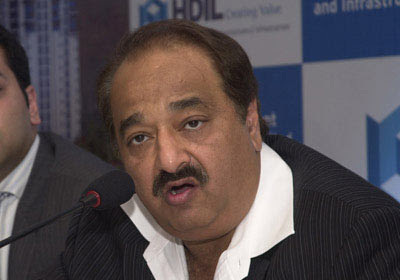 On Friday, Sarang Wadhawan, Vice Chairman & MD of HDIL had sold 26 lakh shares or 0.62% stake, thereby raising Rs. 27 crore. His stake now stands reduced to 3.38%. And on Monday, HDIL’s promoter group pledged 88.64% of their promoter group stake of 39.17%, with IL&FS Trust Company Ltd. The encumbrance amounts to 34.72% of HDIL. Earlier, certain non-promoter shareholders of HDIL had pledged 3.52% stake with IL&FS Trust Company, and with Monday’s transaction, this IL&FS arm holds a pledge to 38.24% of HDIL. This action is likely to caution investors as the pledge is not to raise fresh funds, but to meet some older payment commitments with one SARA Trust promoted by IL&FS. Interestingly, the earlier non-promoter pledges is also for the same purpose. HDIL was known to have significant non-promoter shareholders sharing the Wadhawan surname, probably belonging to the extended family of promoters. Some of them had sold massively during the extended fall of HDIL in 2011. The Robeco sell might also be a timely profit booking, as HDIL had rallied by more than 100% from its 52-Week Low on 2nd January. Major non-promoter shareholders in HDIL include Platinum Investment Management Ltd, Orbis Sicav Asia Ex-Japan Equity Fund, Fidelity Management and Research Ltd, Copthall Mauritius Investment Ltd, CLSA Mauritius Ltd, Stichting Pensioenfonds ABP, Fidelity Investment Trust, Credit Suisse Singapore Ltd, and ICICI Prudential Life Insurance Company Ltd. This is timely news item that you published. Please attach the time also when you publish. It will help reaching proper conclusions. I am wondering why the HDIL co. didnot publish the stock pledge news via SEBI? The news came from IL&FS. And why MD of company mr. Sarang sold around 27 lakhs shares? This is ominous? Isn't it? This might bring the share price further below. Now its in 97-102 range approx. (iam not referring to any resistance or supports). Any idea where the price will be after this change. They sold some property, pledged shares, sold shares - all recently. Are they still in debt ? I thought the rally in Jan-Feb 2012 might have helped.